Does Restaurant Billboard Advertising Still Work? The latest Arbitron In-Car Study is very relevant and paints a fascinating picture of the mind of the American consumer and what impact billboards have on us when it comes to marketing and advertising. The first statistic that jumps out is how much time we spend in our cars. According to the study, the average consumer spends upwards of 20 hours per week in their cars and travel over 200 miles. Given that this is based on a national survey, it is safe to assume that for California, these numbers are higher. The assumption is of course, that this would give the average consumer plenty of time to see your billboard in a given week. But the real question remains. Do they actually SEE the ad and does it influence them to make a purchase? >>Download this checklist to make sure you hire the best graphic design studio for your billboard design. The great news for the restaurant industry is that 58% of viewers aged 18 or older “learned about a restaurant they later visited”. Also, according to the study, “viewers make shopping decisions while in the car,” including 32% who will visit that advertiser later in the week. So does that mean you should run out and spend thousands on a restaurant billboard tomorrow? No. 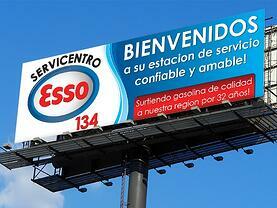 To make a billboard successful, it needs to be part of a strategic plan. You definitely do not want to end up on this billboard fails post or on this other blog post! If you are local to us, the first thing you need to do is find an Inland Empire or Orange County advertising agency that can produce a billboard that conveys a message in a clear, well-designed, entertaining manner. That is not so easy. But it’s also why we are here, telling you about this right now. Call Kulture Konnect today at (951)479-5411 and find out what it takes to create a great restaurant billboard advertising campaign. As you can see from the feature image, we can even do it in spanish!